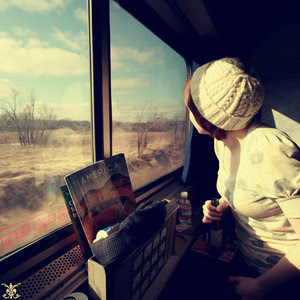 This evening, I will once again be taking the train down to L.A. to stay with my boyfriend for the weekend. I've come to really enjoy train rides because I get to take in the passing life and scenery, which I would never get to see if I was driving myself. I also love the feel of trains- the fact that I don't have to worry about paying attention to traffic and can read my book as we fly by the ocean, puts me completely at ease. And admittingly, a tiny spark of excitement lights up in me when the train horn blows, because I can't help but feel like I'm on my way to Hogwarts (lol). My daughter has a ton of friends down in L.A. She loves riding the train down there. Here in SB the station is so close and my daughter tells me it's only 5-10 minutes for her friends to pick her up. Would you believe I've never taken the train? Yeah it's a pretty convenient alternative to driving! You should definitely try it sometime.